The Setmore iPad app is still being beta tested, with developments forthcoming (stay tuned). So in the meantime, this month we’re launching a few functionality improvements to address some of the rough edges around elapsed-time reminders, allowing customers to reschedule classes, uploading avatars, and a hearty handful of new bug fixes. Continue reading for details. 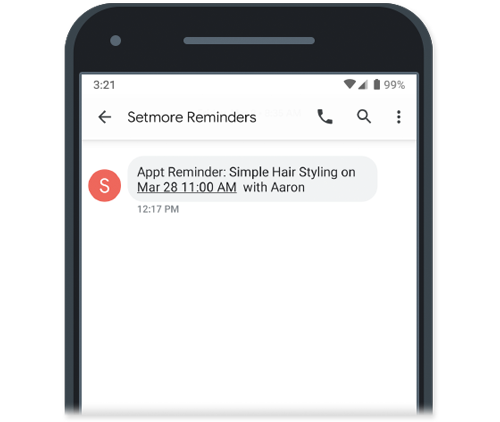 Setmore will now issue an instant text reminder for any appointment booked within your reminder lead time. This improves the previous setup where you would see “Lead Time Elapsed” on the reminder status for some appointments. Setmore will now send a text reminder to that customer. Setmore sends the text reminder about 10-15 minutes after you or the customer books their appointment. This is so we don’t overwhelm your customer with messages ? **Note that this updated feature only applies to newly booked appointments, and not existing appointments on your calendar. Previously, customers could not reschedule or cancel classes on their own. Now we’ve added links for rescheduling/canceling to your class confirmation emails. Customers can use these links to reschedule to a different session of the same class offering, or cancel their attendance if they’re unable to show up. Don’t want customers to reschedule/cancel on their own? No problem! You can deactivate this feature in your Setmore notification settings. Go to Settings > Notifications > Customer. Un-check the box next to “Send the cancel appointment/class link to the customer” to prevent customers from canceling their class attendance. Un-check the box next to “Send the reschedule appointment/class link to the customer” to prevent customers from rescheduling to a different session. 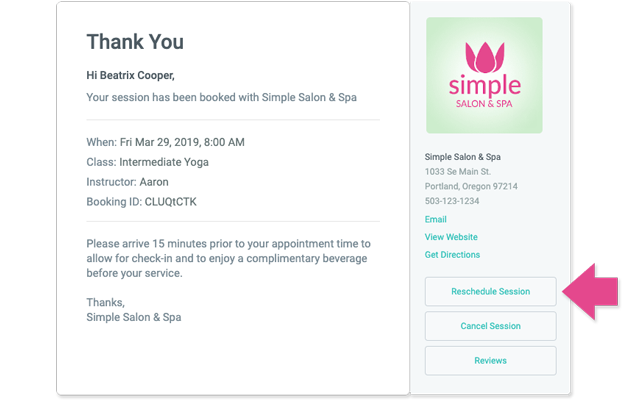 Note: These checkboxes control the presence of a Reschedule/Cancel button in the email confirmation for both regular appointments and classes. One of the best ways to improve your Booking Page engagement is by uploading photos for your staff and services. We’ve improved the upload time so you can add more pictures to your account, faster. Add staff profile pics under Settings > Staff. Click the grey profile icon to upload a photo. Add service profile pics under Settings > Services. Click the grey landscape icon to upload a photo. Repaired a date formatting issue in the Settings > Account > Billing History tab. The Default Calendar View setting is now user-specific and no longer applies account-wide. Resolved an issue that sometimes prevented customers from booking multiple services from the Booking Page. Subpage tabs will no longer show on the Booking Page when they are toggled off. Date and times are now formatted more consistently across all Booking Page subpages and menus. 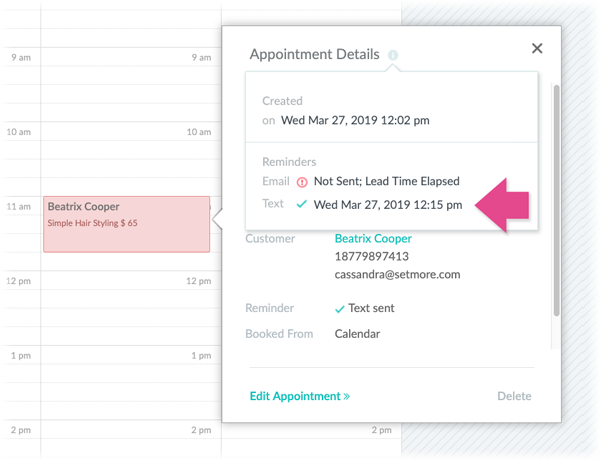 When scheduling a recurring appointment, scheduling conflicts will now display with a more consistent date and time standard. Fixed an issue that sometimes caused the Setmore calendar to load as a blank screen for new accounts. Resolved an issue that sometimes caused staff members to not show in tabs on the Calendar page. Resolved an issue that sometimes prevented removing attendees from a class session. Fixed an issue that caused some customer names to appear as code. Exporting your customer list will now promptly send a downloadable file to your email inbox as expected. Date and times are now formatted more consistently across the Customers tab and all sub-menus. When creating a recurring time off, changes to the start date will now apply as expected. How do we disable this instant reminder for appointments within a lead time? I’ve had three customers so far complain that they are receiving reminders when we move/change their service. One of those customers was sitting in our office when we moved their appointment to a different staff member, and they showed us the text. We don’t want this enabled at all, it’s not helpful and it’s causing confusion with our customers. Hi Alec, thanks for the feedback. I’ll have to confer with our development team since there’s no way to deactivate the setting at this time. Stay tuned for updates, and thanks again for letting us know! Greetings Setmore, is there any plan to update to multiday/crossday appointments? Hi Joelly, no plans as of right now, but it’s something we’re aware of and we have a note about it on our backlog.